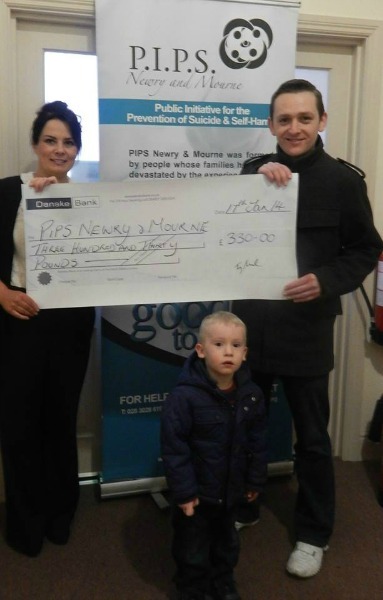 Terry McParland presents Olivia McShane PIPS Newry and Mourne with a cheque for £330.00 the money was raised from a Boxing Day Football match held in The Rope Walk Football Pitch. The players all donated £10 each to play and a raffle was held afterwards. PIPS Newry and Mourne would like to thank the guys for choosing PIPS Newry and Mourne as their charity and thank everyone who took part or donated on the day. Pictured L -R Olivia McShane PIPS Newry and Mourne and Terry McParland and Matthew McParland.